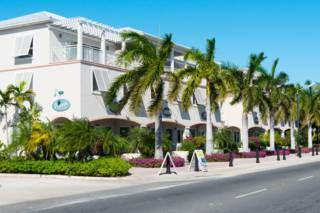 The art galleries of Grace Bay. The central Grace Bay shopping region. 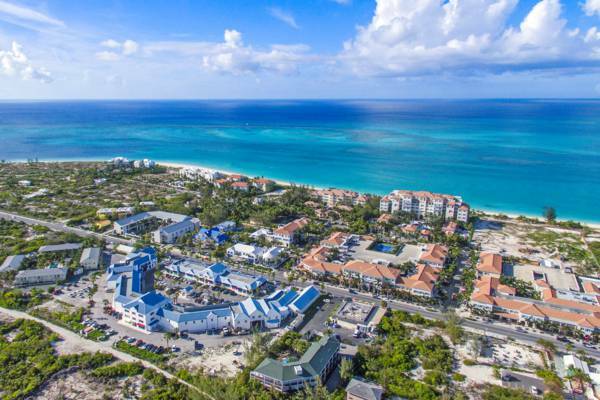 The island of Providenciales supports the majority of retail, shopping and dining establishments in the Turks and Caicos, and the majority of the tourism-oriented businesses of this type are found in plazas and enclaves in the inland Grace Bay region. These complexes range in size from small plazas with a few units, up to the expansive Regent Village and Saltmills, and combine a little of the elements of both high-streets in the United Kingdom and shopping malls in the United States. 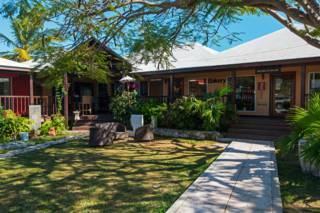 You'll generally find a wide range of both restaurants, art galleries, gift and souvenir shops, and professional services such as law offices, architects and financial services. In the central Grace Bay area, where most shops are located, two banks, the G Graceway Gourmet supermarket, and a small police office can also be found. 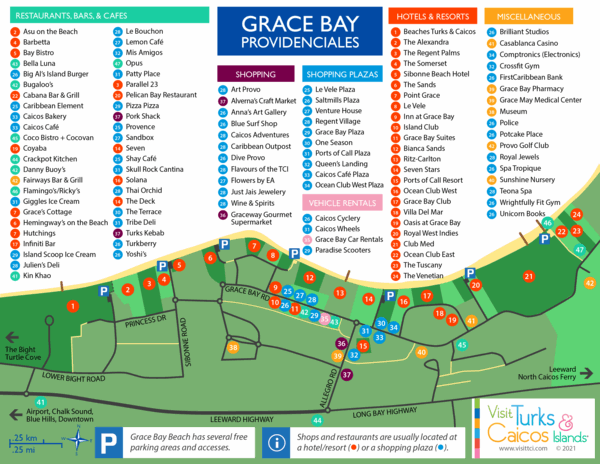 If you’d like to do a little gift or souvenir shopping, it often makes sense to find a suitable parking space (if you have a rental vehicle), and simply explore the Grace Bay area on foot. Most will find it unnecessary to drive the short distances between complexes. Complimentary parking is available at every complex listed here, yet space may be a little limited at the smaller sites. In any case, it’s always possible to find an open space within walking distance. Taxis can be typically be found waiting at the larger plazas, including at Graceway Gourmet, the Regent Village, Saltmills Plaza, and Ports of Call, or at a nearby resort or hotel. 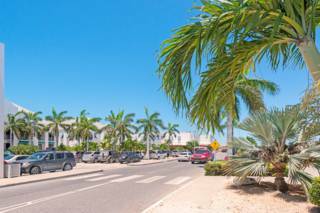 This plaza is centrally located in Grace Bay, with restaurants, cafes, a bakery and professional services. 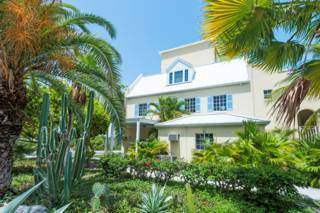 This small plaza is located in the heart of Grace Bay across from the Regent Village. There's a scooter rental shop, pizzeria, ice cream parlour, and a small playground for children. This shopping area is located on Leeward Highway adjacent to the Graceway IGA, the largest supermarket on Providenciales. A wide range of shops and professional services are located here. 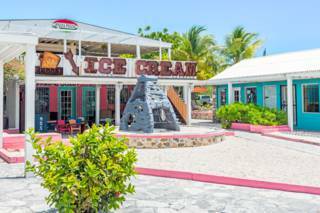 This small shopping area is located adjacent to Ports of Call and is home to a few gifts shops in the Grace Bay area of Providenciales. 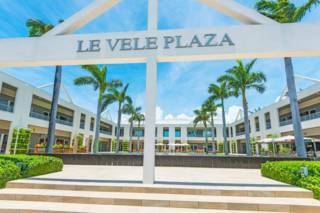 Le Vele Plaza offers a modern and elegant shopping and dining setting in central Grace Bay on Providenciales. This two story complex is home to luxury retail shops, restaurants, and professional offices. 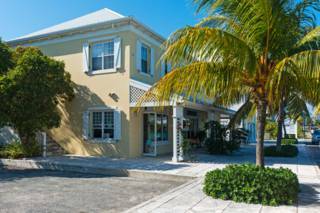 This small plaza is located on Dolphin Avenue in the Grace Bay area of Providenciales. Restaurants, shops, and medical services are here. This small shopping plaza is located in central Grace Bay. Several retail and water sports shops are found here, along with some commercial offices. Ports of Call is a shopping plaza located in Grace Bay. There's a range of bars, restaurants and shops located here, along with pirate-themed statues and decorations. 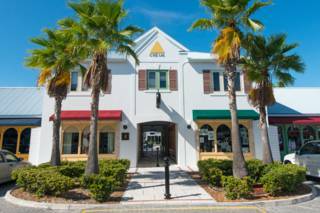 The Regent Village is a retail and commercial plaza in the heart of Grace Bay. This site features restaurants, art galleries, shops and professional offices. 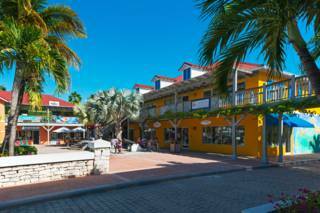 The Saltmills Plaza, located across the street from the Regent Village in Grace Bay, is one of the main shopping plazas on Providenciales. A wide range of restaurants, gift shops, water sports shops and other shops are located here.